On Tuesday, July 31, the Syracuse University Department of Public Safety (DPS), Fire and Life Services (FLSS), and Syracuse University Ambulance (SUA), teamed up with the Syracuse Fire Department for a fire drill at the Biological Research Laboratories (BRL) building. The mock scenario involved four individuals inside the building where the fire was reported, as well as manikins, which all had to be evacuated. DPS and FLSS officers arrived at BRL and quickly determined which floors had smoke conditions and provided that information to the Syracuse Fire Department, who was en route. 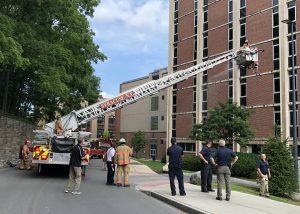 Upon arrival, the Syracuse Fire Department, sent a team inside to perform a search and used their bucket truck to assist with reaching the high floors to put out the mock fire. Once the drill was complete, the Chiefs held a mock press conference with students from Newhouse as part of an assignment for their class.